In accordance with an example embodiment of the present invention a system comprises a console and a card wherein the console comprises a processor, a receiver configured to receive a short range wireless signal, and based on a short range wireless signal received by the receiver, the processor is configured to identify a media file stored in a memory location accessible to the processor and the short range wireless signal received by the receiver is associated with an object and a natural language, and the card comprises a short range wireless communication tag wherein the card has an image either printed or embossed on at least one of its surfaces or the card has a Braille representation on one of its surfaces. In an example use case of the invention, a user may purchase a deck of RFID cards for a natural language of choice such as English or Hindi. Media files associated with the deck of cards may already be pre-stored in a memory of the console. When a user brings an RFID card in a vicinity of the console, the console recognizes the object whose image is either printed, embossed or the object that is represented in Braille on the RFID card. The console also recognizes the language(s) that is/are associated with the card. The console may then do one or more of the following: (1) produce a sound corresponding to the word for the object in as many languages as the user has selected, in a sequential manner (2) display an image of the object on the console screen (2) project the image of the object on an external surface such as a wall or screen, via the console projector. In another example embodiment of the invention, a user may purchase a deck of RFID cards along with a username and password and a www link to a webpage where the user can register the product. After the purchase is registered online, the console is permitted to download data from a server, including media files associated with a deck of cards. The user may then connect the device to the Internet via any of the known techniques such as Wi-Fi or data cable with pre-provided authentication key written on the back of the console and the console will download data corresponding to the purchased deck of cards. MAMIS is the acronym for Method and Apparatus for Multilingual Interactive Self-learning. MAMIS name has been inspired by the word Mother. Like mother teaches a child similarly MAMIS will play the role of an educator imparting multilingual education in a manner which is personalized to each child's need and language of choice. 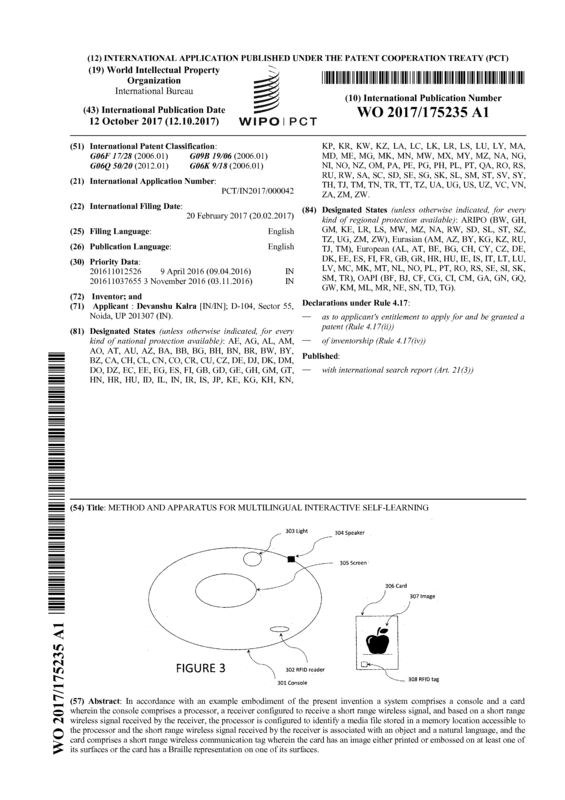 Page created at 2019-04-25 0:35:46, Patent Auction Time.